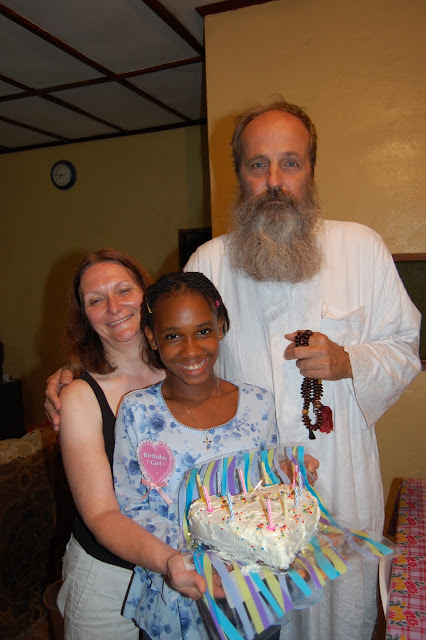 Lucy Jamestina Mansaray is 14 years old today! when we first met and now you are 14 years old! We all love you very much! through NHA. You are such a great help to us all. I saw another plea from Nazareth House today. Did you see it? They need money, they need quite a bit, and they need it now. But what am I supposed to do about this? I read the urgent message, and to be honest, I turned away. I do not have any extra money. There seemed to be nothing I could do until our parish is ready to do another fundraising campaign. I turned away and went back to my day with a breath of prayer, asking God, What can I do? A little while later, Vicki contacted me, and she asked me to write. We need more money, she said. We need it soon. Can you write for us? Write? I can do that! Maybe other people want to know what I want to know. I want to know what Nazareth House is – what it does – how it started – and how I can help. Vicki agreed to let me interview her, so that I could ask my questions. Perhaps you, like me, are new to the APCK, or perhaps you have just stopped by the website because you saw a link somewhere. Perhaps I have asked some of your questions as well. Here is the interview, with me, Stephanie W Lillegard, asking the questions, and Vicki Hicks answering for Nazareth House Apostolate. SLW: When did the work in Sierra Leone begin? NHA: Seraphim first physically went into Sierra Leone, Lenten Season 2000. He went there to pray - to pray in the streets - praying The Name in area of turmoil. SLW: You are raising money for a new compound for your ministry there. What have you been doing without a compound so far? NHA: We've rented small houses in Freetown (at the costs of $10,000 per year). 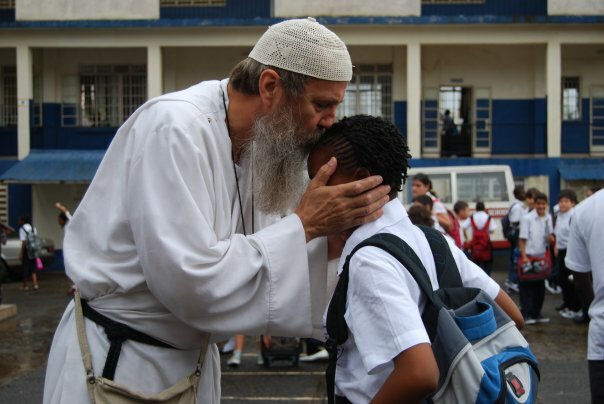 As the need rises and our work grows, it is more and more difficult to remain in such a small place. Renting in Sierra Leone is very troublesome. Landlords demand that tenants pre-pay a year’s rent in advance. We always fix up the place we are renting, only to have the landlord decide not to rent to us anymore because they want the place for themselves or for their family, once we did the work. This happens frequently. There is so much corruption, especially in Freetown. So we are constantly looking for a new place to rent and rental costs are skyrocketing. Once we secure a place that WE own, rental costs become a thing of the past and we can spend the money on those we serve. SLW: This new compound you’re trying to get done – where are you building it? NHA: For years we thought that Freetown was where we should have the compound, since Freetown was the capital city and port of entrance into the country. However, God thought differently and repeatedly tried to get it into our heads to move on. The corruption has increased and it is so hard to do anything there anymore. 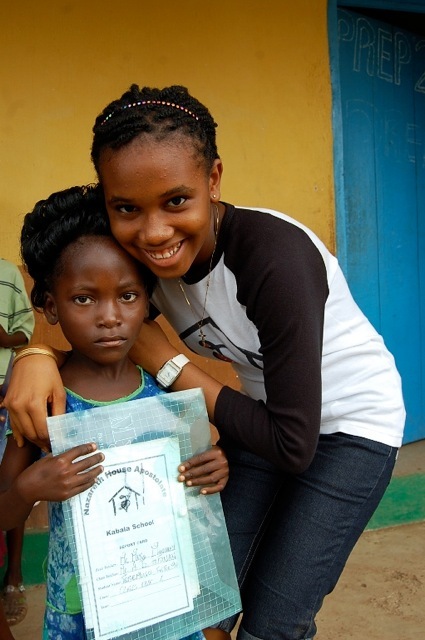 We'd already built a school serving 300 students in Kabala (a town in the Upper Provinces). We make several trips a month into the hidden villages near Kabala to bring food, medicine, and other necessities to them. 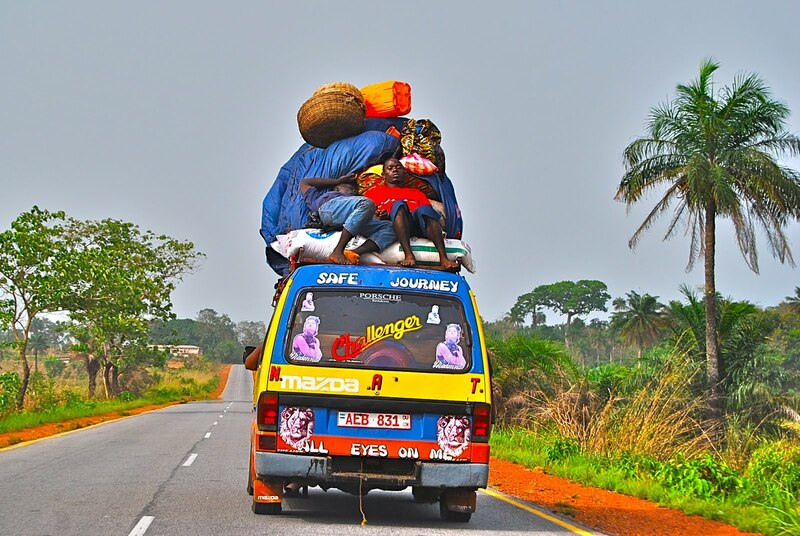 And this trip has become very difficult because, while we are living in the rented house in Freetown, we must drive seven hours in terrible road conditions to get to Kabala. As time goes on we find more and more of our work is in or near Kabala. The people in most need surround this area. These people see no other aid agencies. So naturally, Kabala is the place to be. We are thankful for our little rented compound in Freetown. This compound is known as St. Laurence House - named for the Saint who was martyred after claiming the treasures (riches) of the church were the poor. But this compound is so far away from Kabala, and so far from our work – and because we've fixed up this house we know our landlord will not rent it to us again. He wants to give it to his daughter, who is now of age so that she can start a family. Our rental ends November 31. SLW: What are other the problems you are trying to solve with this project? A) Stop the drain of money wasted on rent to greedy landlords and use it towards the people's needs; B) Establish a permanent residency in Kabala, Sierra Leone, right smack in the middle of the villages we serve, so that we fulfill our goal to live with the people, eat what they eat, be as they be. C) Better monitor and provide for the school. The new compound we are building is right across the dirt road from our NHA School; D) Increase storage. We have limited space to store our supplies (food, medicines, equipment) right now. In the new compound there is a dedicated storage room for all of this which will also accommodate our growth; and, E) Establish a Lazarus House within our new compound. Since death is such an everyday occurrence, many times people are left alone out on the edge of a road or in the bush to die. We will have space to set up a room for the dying, a room for people to die with dignity and with a friend by their side. SLW: How did you come by the land/building/opportunity for this compound? NHA: Last March we were looking for land and the contractor offered us this sight right across from our school. The price ($55,000) was unbelievably great so we took it on faith and made the commitment to purchase it, knowing the needs and how this could answer those needs. It was perfect, there really was no choice. SLW: How much is the total cost of the project? NHA: For the compound structure and immediate land it sits on - $55,000. We would also like to purchase the acreage behind the house for farming (to serve the village with food and put up some hermitages for prayer) for $24,000 and then there is a small house behind the NHA School with some land which is for sale for $7,000. It would be perfect for school classroom expansion - we are growing every day and are at the point of having to turn away students. This is so very sad, every child deserves free education. SLW: How much more money do you need to finish this project? NHA: $30,000 to complete the Compound building. SLW: By when do you need this amount? NHA: As soon as possible. Every time I give an installment to the contractor he can complete a little more on the compound. SLW: What will happen if you do not get it? NHA: Our staff, James and family, will be evicted from our rental property in Freetown and have no place to live and no place to store and administer the work of NHA. NHA will have to struggle to find housing for them, and the work, the giving, the education and the medical will all come to a standstill. The problem with this is that most of the people we serve, although we are doing all we can to educate and help them help themselves, have not completed enough of their education and training for them to be left alone yet. They depend on us to survive. Many will go hungry, many will get sick, some will die. I'm not being dramatic here, people will die. SLW: What do you anticipate the future costs (maintenance, taxes, bribes) of this particular project to be? NHA: There are no taxes in the village, and as for maintenance – it is a new structure and James is quite handy and obsessive about preventative maintenance. This is why we lose the rental houses – we fix them up to be better than when we received them! For maintenance, I figure about $100 per month tops to maintain the new compound, and that might be a little high. We will need a good generator though. There is NO electricity in Kabala. The generator should run about $4,000. The compound will be ours, there will be no bribes necessary for us to stay in it, the Contractor loves us and knows the work we do, and he will ask no bribes. He is an honest man, doing the best job he can for us. SLW: Tell me a story about the compound in Sierra Leone. NHA: The compound is the center of operations for NHA ...and it is the center of life. It's where we work out from, where medicines are sorted, rice is distributed, the sick are brought there, our staff - the family - live there. Seraphim says the Mass there, prayers are prayed there - shoes and supplies are received, stored and distributed from there, tears are shed for one another there, laughs are belched out - it’s where life happens and blends our lives with their lives, becoming one - not the giver and the receiver - but one - like family. In our present, rented compound in Freetown, we have a very narrow, tiny backyard. What goes on there is remarkable. Poor children arrive every morning with buckets to fill with water from our outdoor tap. We pay for the water (it is not totally clean but it is better than what you find elsewhere) and these children have no way of getting water for their families but to daily walk miles to fetch it in heavy buckets from a polluted stream. But we quietly provide this service for them. No one knows, just us and the kids as they come each day. Many vendors wander the streets trying to sell their wares, and they always know that a plate of food is waiting for them in the back yard - so if they can't make a sale, they still know they will not remain hungry at nightfall. I expect this practice to continue and grow probably ten-fold by the move to this new compound. When people are in need, when they need a friend, when they are sad or happy, they come to NHA Compound (St. Laurence House) to find a friend, and there they find many friends. That, to me, is priceless. Have you read to the end of this interview? Is your heart stricken like mine is? What can you do? Give what you can today. Spread the word. Ask your church or office to participate in some way. Now is the time. November is the deadline if James and his family are not to be homeless. Support Nazareth House with whatever God has put into your hands to use, and may God bless our efforts. James is already out distributing the prior boxes received. 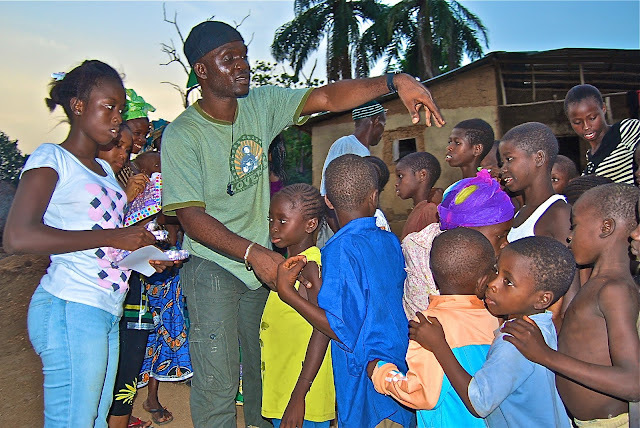 He spent the whole weekend in Kabala, distributing needs and working with the NHA School Staff as they begin their new School Year. and NHA supporters in America. Teamwork at its best. we are thankful that the regular monthly cash donations continue to provide for our work - feeding the hungry, providing the education for the students and salaries for the NHA School, tending to the sick, and supplying the medical clinics. We are most thankful that we have been able to keep this up without any interruption. However, this last month, funding has been more difficult. We've received enough for the monthly needs, but we've received very little towards completion of the compound. Completion of this compound and ability to move in and begin our work are vital to the existence of NHA. We are at a critical stage of construction on the compound and our Contractor needs funds to keep the work going. Delays costs him money as well as NHA. He's been working on the windows which have been very expensive because of the glass, wood and aluminium. There is still much more to be done and we owe a balance of $30,000 towards to the Contractor. The quicker we can get this paid, the quicker we can perform service to the villagers and the school. Those that depend on us for their very existence. We cannot let them down. Currently the storage space in our rented house at St. Laurence House is minimal. And in a few short months, that landlord will resume his house - for good - and our staff and all our supplies will be without housing. We are at a major juncture point in this adventure called Nazareth House Apostolate. We need your help. Please give today. Change Lives, Make a Difference. 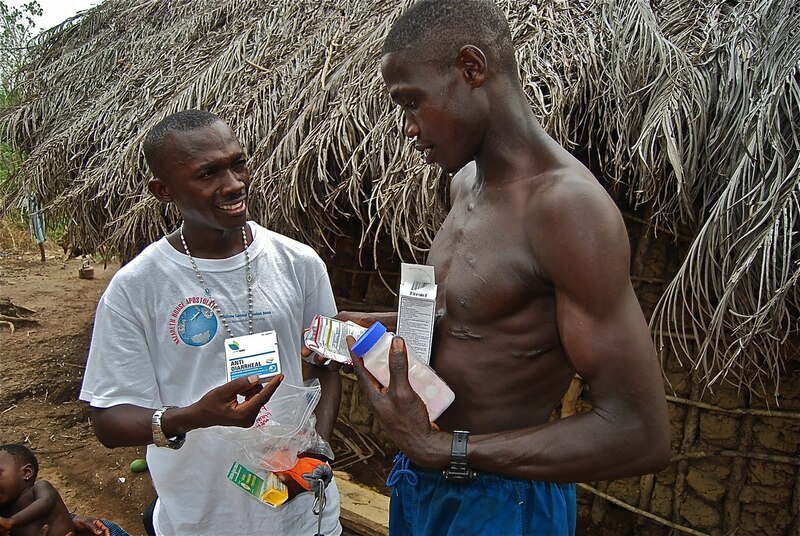 *NOTE: Nazareth House makes monthly shipments of medication from Louisville to Freetown. We encounter tremendous needs in Sierra Leone, yet we ask that people resist the urge to donate items to this cause unless specifically requested. It’s actually prohibitively expensive to export goods from the United States to Sierra Leone. Rather cash donations are preferred and greatly appreciated. This approach benefits the local economy (local skills, labor & materials) and assures your tax deductible donation goes directly to support needs and projects and reduces administration costs such as shipping. is produced from the oil of the palm tree: Elaeis guineensis. 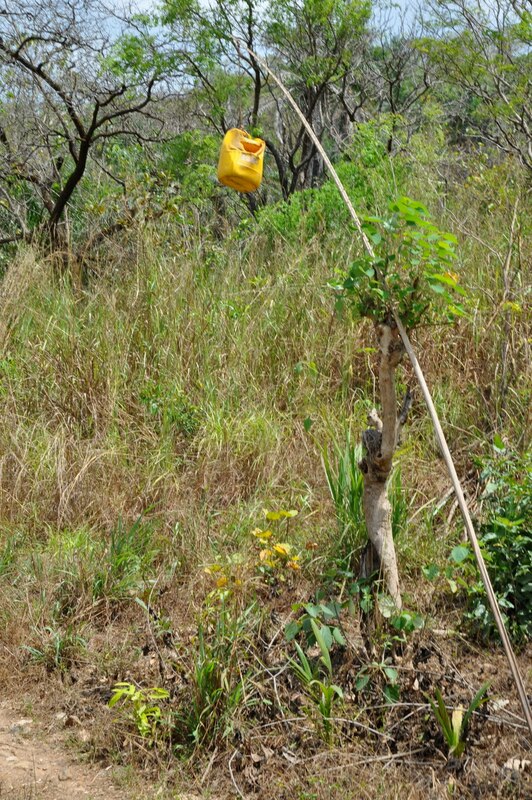 you are made aware of the presence of POYO (palm wine) for sale by a jug hanging from a tree. but reports indicate palm wine was a vital product in the domestic economy of Coastal Sierra Leone by mid 17th Century. with trade continuing (and even flourishing) during the recent Civil War. Palm Wine produced from the sap of Elaeis guineensis is an important nontimber forest product. The trees are saved and cared for to maintain the Palm Wine industry, in addition, this provides the potential to help promote forest conservation efforts. Personally, I'd have to say that Palm Wine is an acquired taste. 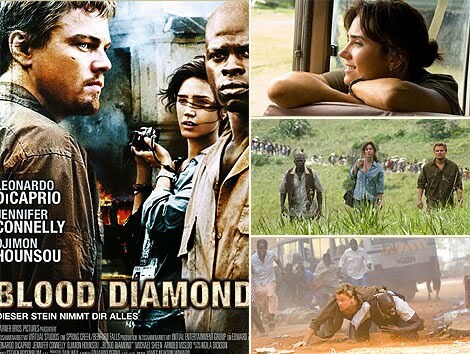 In the Movie: Blood Diamonds. The lead character, Danny, drinks palm wine. In the movie, the character, Maddy, tries some and adversely reacts to the taste, but then has more as they share it. 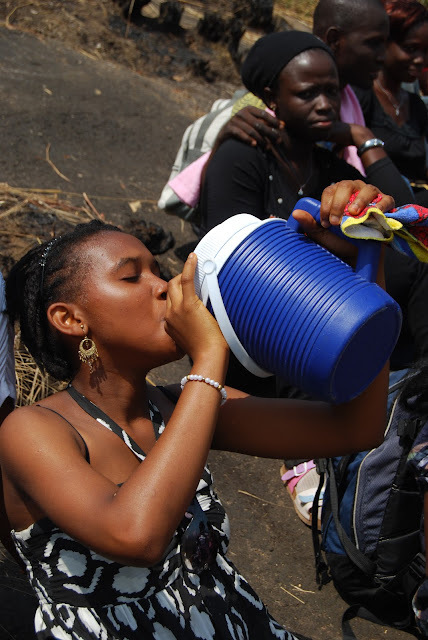 A few years back, I tried Palm Wine at our beloved One Hut Village. I didn't like it. I thought I'd give it another try as Sanu offers it to me. the taste was not to my liking - at all! But there are many who DO like it, and it stimulates the economy. Like in Kentucky, some like bourbon, others hate it; still and all, it stimulates the local economy. 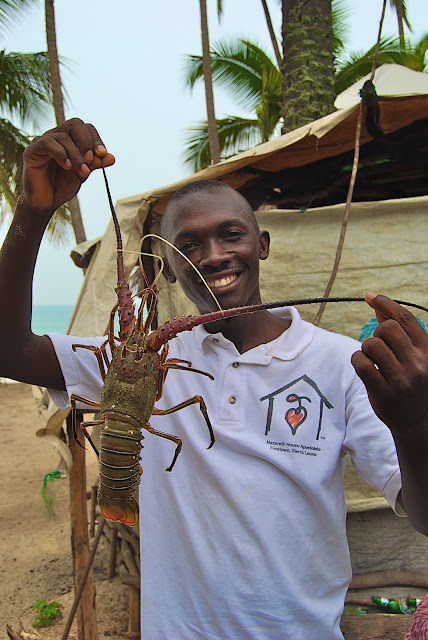 In a country as poor as Sierra Leone, anything to give someone an income allowing them to put food on the table is a good thing - regardless of how it taste!